Dreamed of having your own all-weather arena? There are several options for their construction, but taking shortcuts is a risky business, writes Neil Clarkson. What’s the best way to build a horse arena? If you’ve found someone who knows, why not ask them to explain the true meaning of life while they’re at it. Building an arena is as much art as it is science. If you asked a dozen people for their views on the best way to build and surface an arena, you will end up with a dozen different answers. If you get sick of asking, why not do some online research? Your eyes will end up as rectangular as your arena, and you’ll still have no definitive answer. The problem is regional variation. The raw ingredients for any arena – be they clay, shingle, sand, or limestone – vary from district to district. Lime from one quarry that performs superbly in one arena construction may have different qualities to that taken from a quarry 30km down the road. There are huge variations in the kinds of sands you can buy. Clays, also, demonstrate many different properties. What is clear is that there are several important principles behind the construction of any arena that must be followed if it’s to be good for riding, and long-lived. Pools of water create soft spots. Aside from affecting ride quality, they will also ultimately lead to failure of the surface and its sub-layers. You will eventually end up with patches containing a porridge of all the layers you had lovingly (and expensively) trucked in and used on your arena. The one thing you don’t want is water pooling on your arena. There are two critical issues for drainage. Firstly, you want to create a gentle fall so that water is encouraged off the arena. The most common approach is to create a modest crown down the centre line, and have drains running along each side to collect the water and carry it away. Rainfall will run through the soft top surface to the compacted layer beneath. From here most of it should run off to the sides. It’s simple in theory. Much will depend upon on your rainfall, the soil type, and, hopefully, using the natural lie of the surrounding land to make this all work. If drainage is a major issue, you may need to depart from the model described above. A series of herringbone drains can be installed across an arena to carry water to the outsides. The big dig: a byproduct of arena construction is a large quantity of topsoil. It will cost to cart it away so consider ways of putting it to use. Perhaps it could be shaped into a bund to provide shelter for your arena or home? At the other end of the arena-building spectrum, people have built successful arenas quite cheaply on bony, old free-draining riverflats. Use of a laser or dumpy level is essential to ensure the falls are correct to get water off the arena. A lack of care here will result in pooling and almost certain failure of your surface. Even a modest 40m by 20m arena requires industrial quantities of material and it’s very easy to think that saving a few hundred dollars on the base materials won’t do any harm. Let’s looks at a basic arena recipe: Excavate to a good clay base. (Bring in the clay if necessary). Apply at least a 100mm layer of AP65 (this is a natural mix of gravel and sand from which stones bigger than 65mm across have been removed). Once compacted, apply a similar amount of lime and compact it. Apply a thin layer of crusher dust and then your top layer to the desired thickness. With AP65 weighing about two tonnes per cubic metre, you won’t get any more than 12 cubic metres per truckload. For a minimum 100mm thick layer, you’ll need 80 cubic metres, or nearly seven truckloads, to cover your arena. The base course arrives: 17 truckloads of AP65. Just five days later, construction of this arena stalled for the winter because heavy rainfall meant trucks could no longer get to the site. Suppliers may be looking to charge you $15 a cubic metre or more to deliver it. If you’re reasonably close to the source, you might save on transport costs by hiring trucks on an hourly rate to deliver the materials. Be sure of your maths before committing either way. You can save some money if you have a suitable location on your property for any topsoil removed during construction. Otherwise, this material will need to be trucked away, creating additional cost. Arena construction has been compared to road construction. A road will be only successful if the tarseal or asphalt is going on to a hard, compacted base. Excavate to a good base before trucking in materials. The top layer has to display a couple of other practical properties. You don’t want it to whip up a dust storm in a strong wind, and you certainly don’t want it taking flight in a gale. The best arena surface in the world would be little use in Canterbury if it cannot hold its ground against a hot, dry nor’west gale. So what makes an ideal arena surface? Cost, availability, and regional variation will all play an important factor in your final choice. In parts of the United States, for example, people have access to shredded leather. These create a good-value surface and provide some cushioning, but it will break down over time. It’s probably a better option in a drier climate. Wood chips or post peelings will last much longer than bark, which is usually too soft and will break down with use to a powder, only to blow away. It’s important the pieces you get are of reasonably uniform size to ensure your arena provides consistent footing. This surface will need an occasional top-up, so make sure you build your arena to allow continued truck access. Old tyres are a real headache for communities to dispose of, as they tend to rise to the surface in landfills unless cut up. But processing plants are at least $2 million each, so we’re unlikely to see them popping up in any numbers around the country anytime soon. Internationally, rubber is considered an excellent surface and is sometimes mixed with sand. It needs to be free of the metal from steel-belted radials and the pieces should be of a reasonably uniform size. River sand is a common finishing material for arenas. It can be mixed with sawdust or rubber to improve its properties. Not all sands are created equal, with considerable regional variation. Sand is essentially broken-down rock, so it will not decompose like bark or woodchips. However, it will erode over time. That said, you should expect several years of good use before any major reworking needs to be considered. The sand you choose will need to be “cleaned” – that is, all the silt and clay washed from it. Using a sand with silt and clay will not only create a dust problem, but will lead over time to your arena surfacing compacting down. Do not underestimate the dust issue. Breathing dust of any kind is a health hazard. The dust from silica sand, for example, is known to cause a nasty lung condition called silicosis. Aside from the health concerns, it will cover surrounding buildings and features, and could easily get you in trouble with a neighbour. The sand should also be screened. This is where undesirably large particles are filtered out to leave material of uniform size. Ideally, you want a mix of round and angular particles. If there are too many round particles, the sand will move too easily under your horse’s hooves – kind of like running on marbles. Sharper particles aid traction, but if your sand is all sharp material, it may prove to be too abrasive on your horse’s feet. Essentially, the more uniform the particle size, the less prone the material will be to compaction. Compaction is simply a fancy term for smaller particles filling the gaps between bigger particles. Some regions have an abundance of braided rivers carrying countless tonnes of river sand. Other areas, particularly those with a recent volcanic past, may tend to produce sands containing softer volcanic elements, such as pumice. Some of these materials will break down with use, turn to dust, and blow away. When it comes to sand, you’ll need to talk to the companies that process it, who should be well aware of which of their products have been used with success on horse arenas. Better still, ask people who have built an arena what they think of their sand surface. How thick should the top layer be? As a general rule, start at no more than 50mm and, if you’re not satisfied, add 10mm or so at a time until you’re happy. It’s possible you may have access in your region to an affordable chip. Some, limestone in particular, will break down with use and will need replacing. If you feel this will make an adequate surface, ensure the material you take delivery of is of uniform size. This will ensure a consistent riding surface and reduce the amount of compaction. Could it be mixed with a coarse local sand to improve its qualities? Wouldn’t it be great if soil provided an ideal arena footing? Unfortunately, most top-soils display many unsuitable properties. It tends to become compacted, can be slippery when wet, varies greatly in its properties between wet or dry, and can become dangerously uneven when it chops up then dries out between uses. Drainage is rarely good enough to function effectively. That isn’t to say that, with the right soil type and the correct amount of moisture, top-soil won’t work well. However, maintaining conditions that are “just right” for any length of time will usually prove nigh-on impossible. Neglecting maintenance will shorten your arena’s life. High traffic areas will tend to compact down, or the topping material will be flicked to one side. Ignore it for too long and you’ll find your horses working on the compacted sublayer. Traffic wear is easily dealt with when tackled early, with a light harrow-like device that will not only redistribute the material, but penetrates a little, helping to loosen any compaction. Given the gradient placed on an arena, the tendency is for the sand or other surface material to slowly but surely migrate to the outside. If you ignore this tendency for too long, your only option will be to get a small excavator with a split bucket to gently scrap it back towards the crown. My personal choice for dragging an arena is a heavy metal bar with two loops of chain trailing behind, towed behind a quad bike. During any dragging session, I always go in one direction only and offset the bar a little so it tends to push the material back uphill. This may not totally remove the eventually need for a small excavator, but it will certainly delay it. A durable, long-lasting all-weather area. An arena’s ultimate success, however, will depend most upon the work that went on beneath the surface. Don’t expect your arena to come cheaply. There are no cunning or cost-saving shortcuts to success. Your investment will be similar, and probably more, than getting out your chequebook for a new horsefloat. You’ll be doing well to find a contractor who can build one for under $12,000, but much will depend upon how close the raw materials are. For the likes of your base fill, you’ll most likely be paying more for cartage than for the material itself. You can easily pay $20,000 for a finished arena, so it’s important to get everything right. There are contractors who specialize in arena construction. They will know the best local materials to use and their all-important properties. However you decide to proceed, talk to locals who have built an arena. Ask to visit and question them on any problems they may have encountered before or after it went into service. Many successful arena surfaces have evolved over the years. It may have started with a sand topping and ended up with a woodchip/sand mix. Ask the owners why they modified their layer of footing. These kinds of insights will ultimately prove invaluable in building a successful arena; and those that have given good service for many years should be given particular scrutiny. The last thing you want to do is build an arena that fails, because one thing is certain: you’ll be hearing the rumble of heavy machinery again – and getting it fixed won’t be cheap. Would love to know how to get an arena for $20k – can you suggest any contractors in the north Auckland area that could achieve this, all my quotes are coming back in the $50k region for a 20×40! Thanks for your feedback – the article was written in 2006, so inflation should be noted, as should the variance in base costs between regions – and countries. The prices originally mentioned in the article reflected the costs at that time based on our research. any ideas on what would be best to put ontop of a concrete substraight? Ideally rubber matting down frist, then sand i believe, but that is very expensive.. would mix of sand & woodchip or sand and rubber be ok? Quite agree, with proper drainage we are in the process of construction getting our own materisls and subcontracting. We are up to £20k and there is still a way to go. Is there a way of locating existing drains in our arena? You asked this question a long time ago. Just saw it today. Could you please suggest the required area for an arena to conditioning 30 horses, we have ground water for enough grassing …. We live in Ontario, Canada. We built our outdoor ring over two years. First year we had the excavation done down to the clay. That way we could see where the ground settled and where any low spots were. This year is the finishing. Total cost of a 110′ x 160′ will be about $25,000 – $30,000, plus HST. Work was done by a good quality company with us doing our own fencing and gates (extra costs). What causes a riding surface to wash board? We just put in our indoor arena and I have found we have one spot that is a little to deep – about 4 ft wide X 4 ft. long. Is there a way to fix just that spot? Any input would be helpful. Thank you. Is there anyone who could tell me about or give me a quote on extending our arena. we only want to add about a 1 1/2 meters to the side. The area I live has pumice soils under 200mm of top soil. If I compacted the pumice layer on a slight fall, would I need to add the base layers and just put the sand top layer directly onto the compacted pumice? I found this post very informative, I was working in a Arena Construction company. They were providing best services of arena. Your post is so informative for those who are looking to build horse arenas. 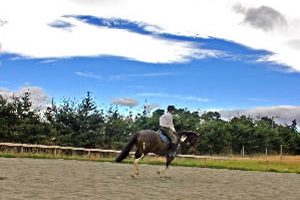 I am one of them who are helping people to make the best horse riding arenas. I totally agree with you. Your all points are so effective and I think, we should try it practically.